Managers can use the Updates tool to get weekly updates on their direct reports. Lattice gives you the ability to customize that experience. 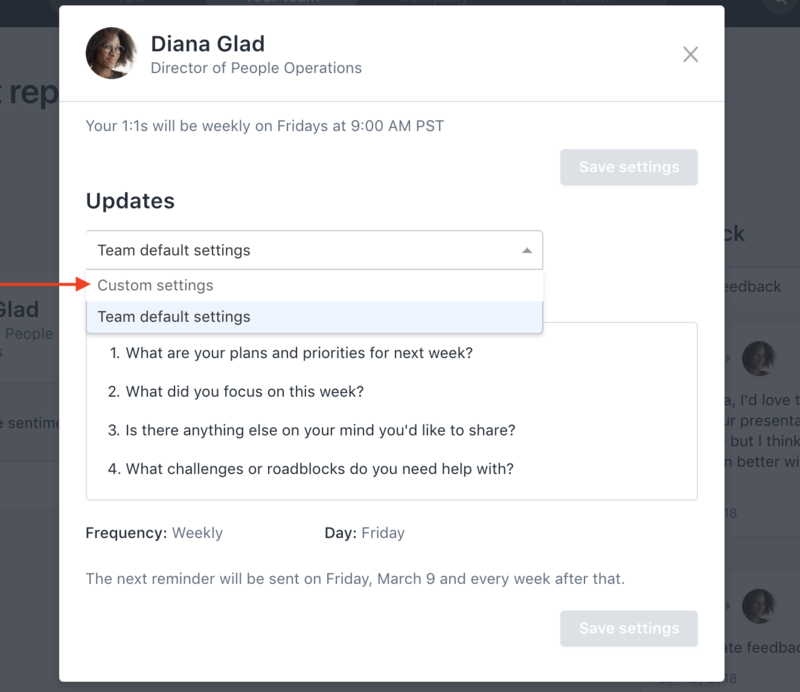 If your organization allows you as a manager to set your own update settings, you can create your own questions to ask your team or each separate person on an individual level. To set custom questions on a team level, go to the "Your Team" page, at the "Direct Report" tab click on "Settings" on the left navigation bar. From the team settings screen you can then change the update cadence as well as edit the questions that are asked to everyone on your team. Lattice provides a set of default questions that you can ask, but you can input your own questions by deleting the default ones and adding your own. Here's a list of some potential questions that will help you stay aligned with your team. 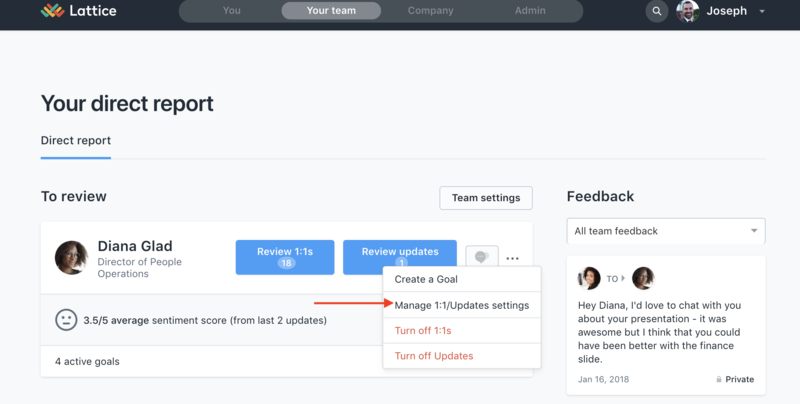 You can also choose to set how often you ask your team for updates to either weekly, once every two weeks, or monthly, as well as change the day of the week that the reminders are sent out. 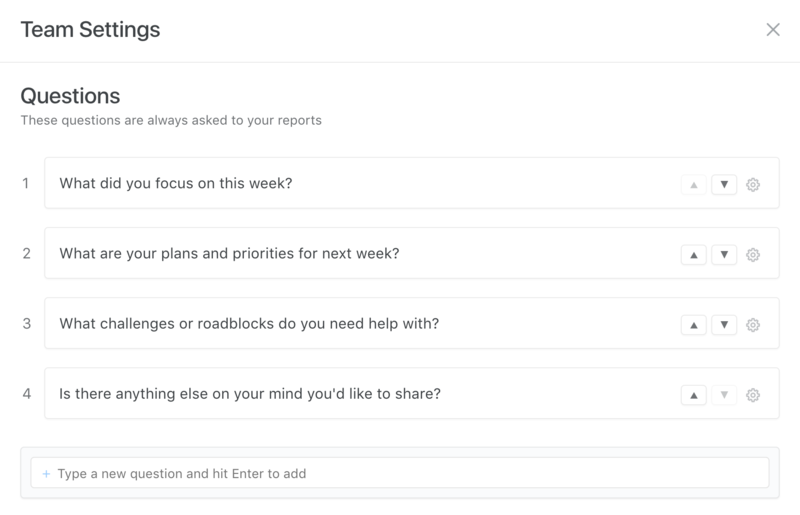 To set custom questions on an individual level, go to the "Your Team" page and click on the ellipsis next to your direct report's name. If Updates are enabled, you will see the option to "Manage 1:1/Updates settings". From here, choose "Custom settings" from the drop down under the Updates section and this will allow you to customize both the questions and frequency for that specific employee. After you've set individualized questions for someone, changing your team questions will not affect the questions that they are asked.